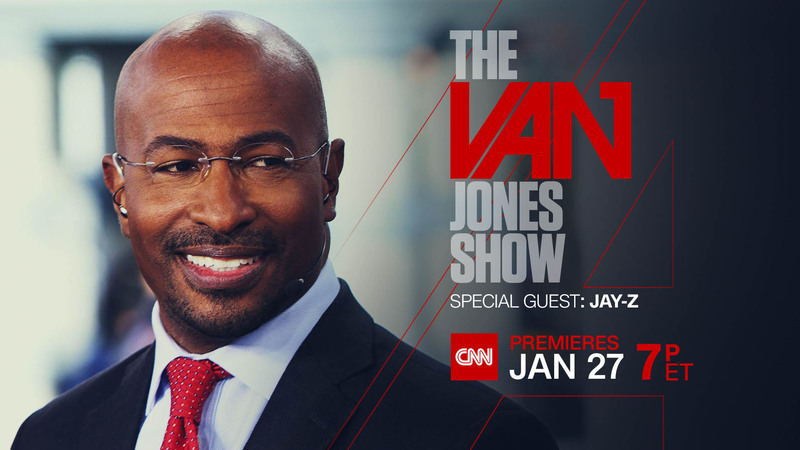 WASHINGTON, D.C. – Jan. 19, 2018 – JAY-Z will appear as the marquee guest on the debut episode of The Van Jones Show on CNN at 7 p.m. ET on Saturday, Jan. 27. A multi-award winning artist, popular culture icon and entrepreneur, Shawn “JAY-Z” Carter is a 21-time Grammy Award-winner with multiple businesses and accolades across the recording industry. Carter co-owns the global streaming service TIDAL, founded Roc Nation, launched Roc Nation Sports and the Made in America music festival. In 2017, JAY-Z became the first hip-hop artist to be inducted into the Songwriters Hall of Fame. Airing twice monthly, The Van Jones Show will continue to build on the success of CNN’s The Messy Truth with Van Jones. The new program will highlight Van’s unique take on the current administration and explore the major issues and movements that will shape the 2018 and 2020 elections. Jones will feature political and cultural guests and include raw conversations with Americans from across the country and political spectrum. In addition to the TV airings, The Van Jones Show will stream live for subscribers via CNNgo (at CNN.com/go and via CNNgo apps for Apple TV, Roku, Amazon Fire, Samsung Smart TV and Android TV) and on the CNN mobile apps for iOS and Android. The show will also be available the day after each episode on demand via cable/satellite systems, CNNgo platforms and CNN mobile apps.